Discover the amazing restorative powers of chocolate milk on tired muscles, how running can actually be good for your knees and how even just 20 minutes of regular exercise can transform your health and well-being. Right now, modern science is revolutionizing the traditional workout. More is known about exercise, health and fitness than ever before, from how (and how much) we should be exercising, to the pros and cons of barefoot running and the effect music can have on a workout. In The First Twenty Minutes New York Times columnist Gretchen Reynolds has turned the key findings of cutting-edge research into practical, user-friendly advice to help you improve the way you exercise. 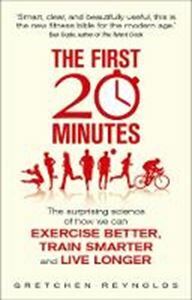 Whether you are a sprinter or a marathon runner, whether your goal is weight loss or a faster 5k, this book provides evidence-based answers showing you how you can train more efficiently, recover more quickly and reap all the physical and mental benefits of an exercise regime specifically tailored to meet your individual needs.